script for Story 1 . Marguerite Duras’ World War II memoir The War (La Douleur) describes her time in Nazi-occupied Paris, when both she and François Mitterand were active members of the French resistance. Joanna Settle and Katie Taber discovered that they were both drawn to Duras' text separately, and fed off each other's concepts to create a working adaptation of the memoir. War is written in three seemingly concurrent parts, each describing a facet of Duras' experience during those years. Part I describes her liaisons with a Nazi officer from whom she hoped to glean information, and the seemingly unending wait for her husband, Robert L., to return from Dachau. (Duras' husband was imprisoned in the concentration camp after his involvement with the resistance). Settle and Taber chose to focus their adaptation on these two sections. Each adapted one portion of the memoir, and Settle directed the entire work-in-progress evening. Taber appeared in both halves of the adaptation. 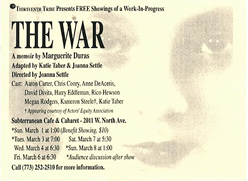 The War was performed as a work-in-progress on the second floor of The Subterranean, a bar in Wicker Park, Chicago. This donated space, smelling faintly of wine and stale cigarettes, featured a black and white checkered floor and accents of woodwork suggesting at once the halls of government agencies and the culture of the Paris café. Actors performed the adaptation, (which underwent major revisions throughout the development process - right up to the performance day), with scripts in-hand. Company members Katie Taber and Anne DeAcetis shared the role of Marguerite Duras, personifying the divergent experiences described in Duras' original. Also featured were Artistic Associates Kameron Steele (as Rabier, the Nazi officer), and David Divita (chorus). Choreography and movement sequences included a 9-minute pause, during which the audience entirely lost track of time. Sound design considerations led the way to creating this drawn-out, saturated sense of experience. Artistic Associate Mike Frank created his first sound design for the company, performing live in the Foley tradition: pouring wine into a glass at a microphone, clinking the plates and silverware of a busy café, and adding tension with the soft rustle of papers.